Designed & engineered here in East Sussex. Instructions: Like most car parts, none of these products come with fitting instructions. Fitment would depend on your individual vehicle system. 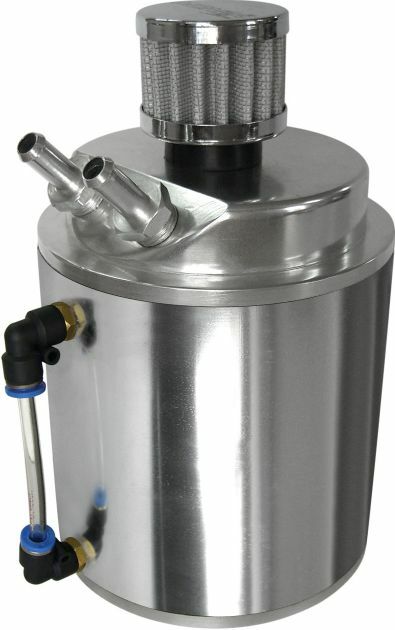 Custom Tanks: We can only supply products exactly as they are detailed and photographed in the product description; unfortunately we are unable to produce an individual tank to a customers' own designs - our tanks are very competitively priced for such high quality items because we produce them on tooling on short production runs, rather than one at a time. 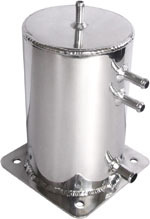 Many previous customers have found it significantly more cost effective for them to have their machine shop modify one of our existing designs than to commission a complete tank elsewhere. We have seen also this tank usefully employed by our customers as an intercooler and windscreen washer tank. 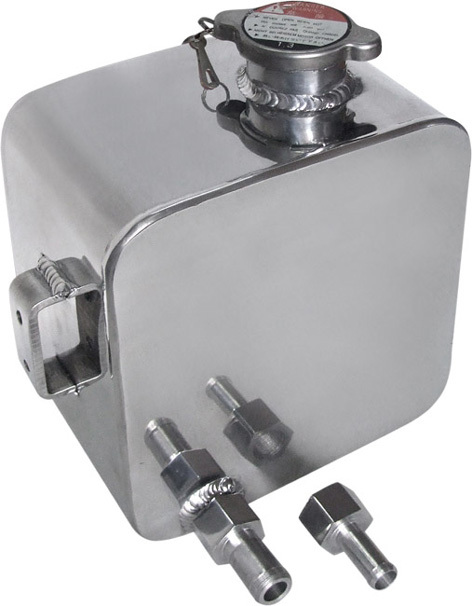 Unlike an expansion tank (which can be mounted anywhere) a breather tank must be mounted at the highest point of the cooling system to operate efficiently. Prevents air locks and leaves room for expansion. These tanks were produced as a small run for a UK sports car manufacturer currently in receivership, to their pattern. We have a few left. 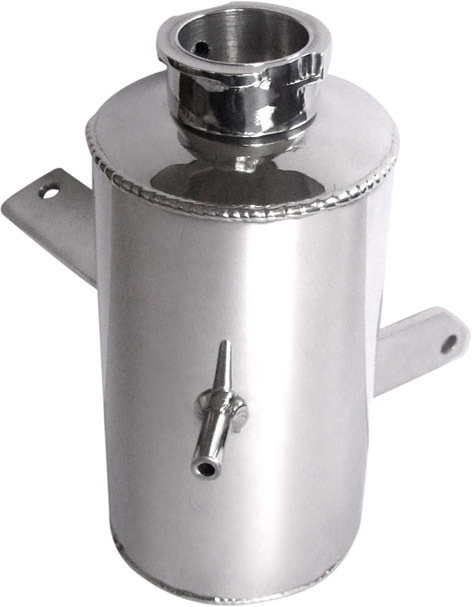 If you can use (or cut off) the mounting brackets then this is a superbly produced tank at a budget price. Doubtless with some imagination it could be used as a tank for a variety of purposes - power steering reservoir, washer tank etc. 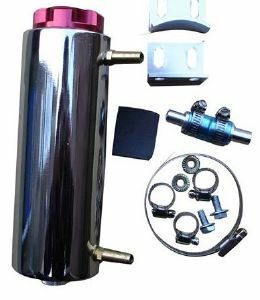 Polished alloy, takes standard size (ie UK, European, American but not "mini" Japanese) twist-off pressure cap (not supplied). If cap is required see radiator cap section. Capacity 800ml. 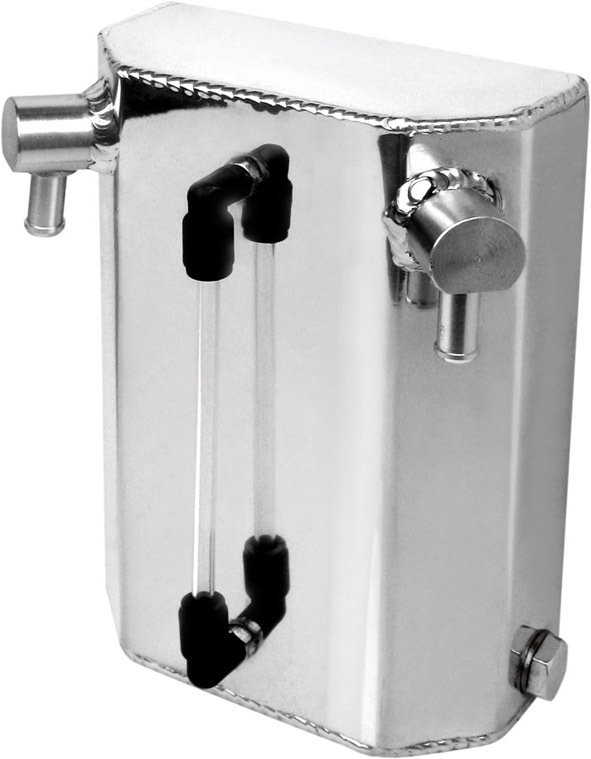 Unit measures 230 mm (9") tall (including filter) by 75mm (3") diameter, 12mm (1/2") pipe size. The tank is fitted with twin inputs so it will suit V configurations and twin cams as well as standard inline engine configurations . If only one inlet is to be used then either block off the spare one with a blanking plug or T-Piece. Beautifully made oil catch can - will enhance under bonnet appearance - this tank is mirror-finish polished alloy, please do not confuse with cheap heavy chrome imitations. 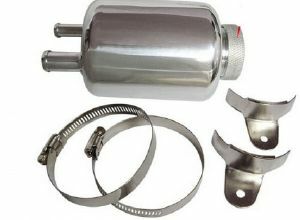 Polished alloy 1L oil catch tank kit. Fitted with top mounted twin inlets, sight glass & magnetic drain plug. Kit supplied with both 12mm OD (1/2") and 15mm OD (5/8") screw in barbed alloy pipe stubs, kit also includes blanking plug for use if only one inlet is required. 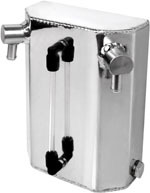 The slimline design of this tank means it will often fit available space where other tanks wont. 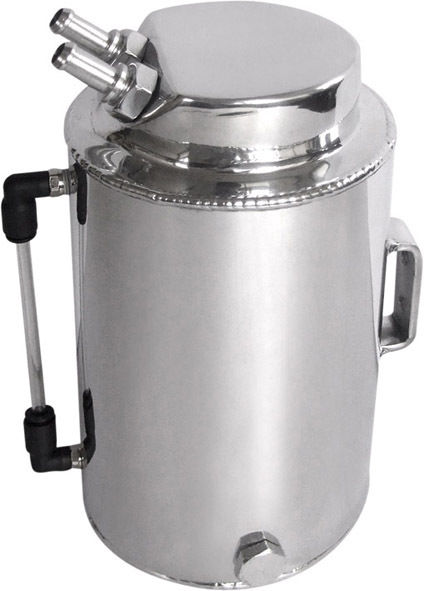 Capacity 1.1L. Unit measures 225mm tall by 80mm wide by 65mm deep. 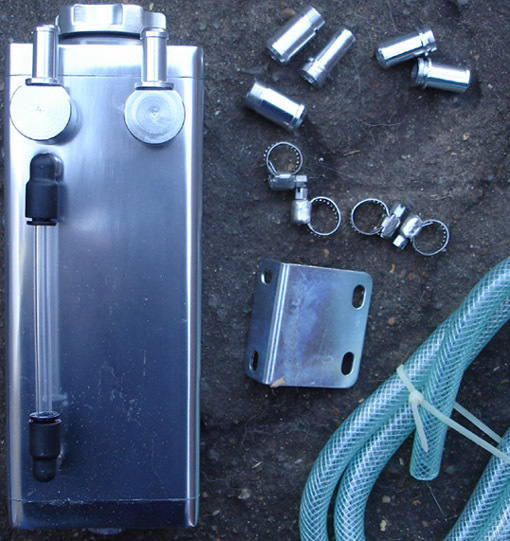 Supplied complete with hose clips, mounting bracket, and 1 metre hose. Two 6mm outside diameter pipes emerge from the bottom of the tank, one feeding the tank from the radiator, the other passing to the top of the tank to let air in and out. Prevents misfiring and fuel starvation/fuel surge during hard cornering & braking by supplying a constant fuel flow to the engine (and prevents damage to fuel pump from running dry). Large polished alloy oil catch tank kit. Fitted with top mounted twin inlets & sight glass. Supplied with 100cm braided PVC hose & 4 hoseclips (additional hose can be purchased if required). 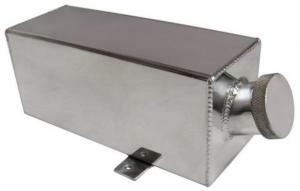 Large spun alloy oil catch tank kit. 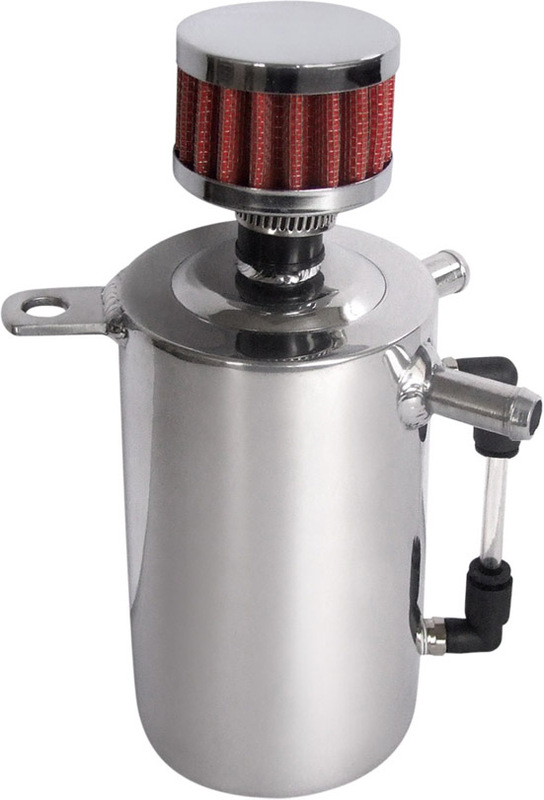 Fitted with top mounted twin inlets, stainless breather filter, sight glass, integral rear mounting bracket. Overall height (including top mounted filter) 234mm, diameter 120mm, 526 gram.